Tickets are on sale for this year's Enclothe: Timeless fashion show, which features creations by students in Bumpers College's apparel merchandising and product development program. FAYETTEVILLE, Ark. 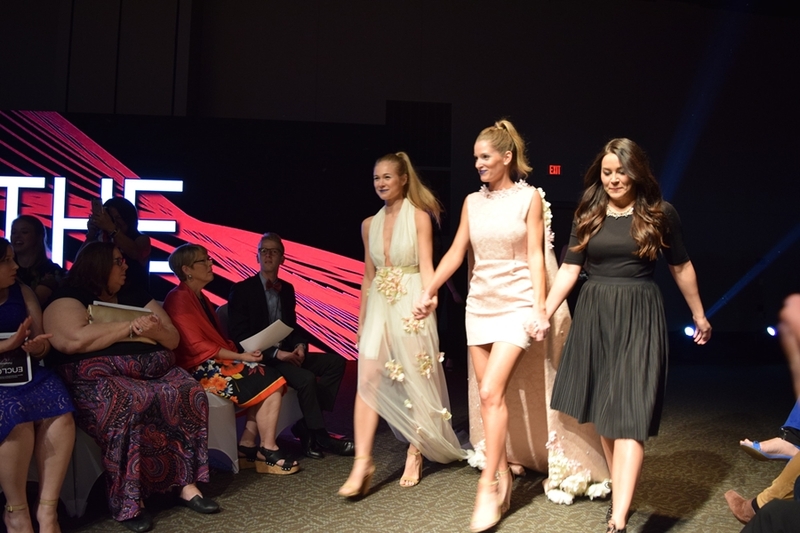 – University of Arkansas students in apparel merchandising and product development are working with students in several disciplines across campus to showcase each group’s specific skills at this year’s Enclothe: Timeless fashion show. The annual spring fashion show will be held at 8 p.m. Thursday, April 12, in the Fayetteville Town Center. It showcases outfits created and designed by apparel students in the Dale Bumpers College of Agricultural, Food and Life Sciences. Apparel merchandising and product development students are partnering with students in electrical engineering, horticulture, computer science, computer engineering, business, marketing and the Tesseract Center for Immersive Environments and Game Design to showcase fashion, technology and design. Students from Elkins High School are also participating. Juniors and seniors in Hubert’s Advanced Apparel Production class are completing outfits to be modeled in the show. Robert Saunders, assistant head of the Department of Electrical Engineering in the College of Engineering, has students participating for the second straight year. Electrical engineering students will be transmitting biomedical sensor data from wearable devices on the outfits that monitor the heart rate and rhythm, oxygen saturation levels and body temperature of the models. In some garments the installed LED and fiber optic lights will show feedback of the measured biomedical data. Computer science and computer engineering students will receive the data from the biomedical sensors, process it and combine it with music to generate visualizations in real time to show the potential for using such data, and give a fresh perspective on data visualization. For the first time, the J. William Fulbright College of Arts and Sciences is involved in the project with students from its Tesseract Center providing consultation and support for the computer science and computer engineering component of the show. This is also the second year that horticulture instructor Shannon Mason’s students are adding their own kind of visualization to the show, preparing and arranging spring floral displays. Students from the Sam M. Walton College of Business are also participating by developing a business and marketing plan to help the show cover expenses and ultimately become profitable. The students from Elkins High School are installing decorative lighting along with the runway. General admission tickets are $35 and U of A student tickets are $15, and they must be purchased by April 9. Any unsold tickets will be available at the door the night of the show for $50. Purchase tickets online. For more information, call the School of Human Environmental Sciences and AMPD at 479-575-5146, or email enclothe@uark.edu or hesc@uark.edu.